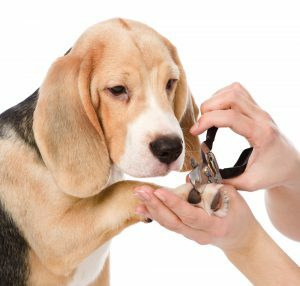 Your dog won’t understand that grooming is for his benefit and since you can’t just explain it to him, getting him used to the tools and procedures of grooming will minimize the scary and painful sides of grooming as much as possible. Some dogs may get scared or just not like being touched in certain places, but you can help him or her get used to what’s going to happen at the groomers in the safety of your home. By getting your dog a bit familiar with some of the activities associated with grooming, you’ll not only make it easier for him, but you’ll also improve the whole experience for both your dog and your dog’s groomer. By desensitizing your dog to tools used in grooming as well as grooming practices, s/he will learn that there is nothing to fear and all of you; your dog, you, and the groomer, will all have a much better time. Here are ten ways to get your dog ready for the groomer. It is usually a nightmare for groomers when a dog can’t stand being touched on the paws. The best time to start preparing your dog is when he is a puppy. You don’t have to touch the paws for long, just get him used to being touched. In addition, pat your dog all over, observing his reactions. Touch his legs, sides of his body, his face, his tail, even his rear end. If the dog shows sensitivity or nervousness, don’t push it. Rather lighten up the pressure and try again as your dog gets more comfortable with your touching him. As your dog relaxes, you can return to areas where he was nervous or sensitive. Keep these sessions short; the duration isn’t as important as the frequency. The grooming experience can be somewhat traumatic at first, so it’s best to get your dog started getting used to it as a pup as puppies adapt much faster. In addition, the fur is more manageable and will be less matted. Even if your puppy doesn’t need a haircut or his nails trimmed, take him anyway. Taking him for a “get to know the groomer” appointment will result in better actual appointments later. Start brushing your dog’s hair as a puppy. If your pup acts scared or intimidated with the brush, start with the slick side instead of the bristled side. Getting him used to the brush at an early age will be better for him, you, and the groomer in the long run. TIP: If he seems afraid at first, use dog treats to coax him, getting his attention away from the brush. Keep a check on both this feet and ears. Debris can get stuck, causing discomfort. Additionally, your pet needs to get used to his feet being touched and his nails being trimmed. You can touch his nails with your hand first, then using dog nail clippers, to get him used to the process and tool.If you plan on cutting his nails yourself, work your way up to clipping one at a time until you’re sure he’s comfortable with the action as well as the clippers. Also run your fingers over his ears to simulate them being cleaned or trimmed. Getting your dog used to going to the groomer depends largely on you taking him regularly. Just brushing alone is not enough to keep his fur in check. If you want his fur to be as healthy as possible, taking him to the groomer regularly will help with that. Additionally, the more often you take your pup to the groomer, the faster he will become accustomed to it and be comfortable with it. Your dog can pick up on your anxiety, so stay calm when dropping him off at the groomers. If you’re anxious, it’s more likely he will be anxious as well, making him more scared and apt to squirm during grooming. In addition, don’t go in to see your pet either. This could make him excited, which in turn will make the groomer’s job even harder. Rather wait until the groomer tells you that your dog is ready. Some groomers will allow you to stay with your pet, but this needs to be agreed upon prior to making an appointment. Your dog’s groomer works with lots of dogs, including dogs of the same breed as yours. This doesn’t mean they automatically know how your want your dog groomed. Some owners ask for specific types of grooming, some don’t. It’s best if you can be as specific as possible, unless you leave it up to the groomer to decide. If so, don’t complain if you don’t like the results. If you know what you want, speak up or bring a picture. Your groomer will appreciate it. Your dog’s groomer has gone through training and knows what type of grooming is best for your breed of dog. This means they know what types of cuts will look best or feel best for the dog. If you ask for one thing and your groomer suggests something else, they have a reason. At least listen to what the groomer has to say; it may be in your dog’s best interest. Don’t be afraid to wash your dog too often. As long as you use the right type of dog shampoo, you don’t have to worry about drying out the dog’s skin or hair. Frequent washing will make the groomer’s job much easier, so don’t be afraid to ask which type of shampoo is best for your pup. In addition, the groomer will be able to recommend techniques that won’t contribute to skin trouble or matting issues. Matting can be a serious issue, causing even more problems for your dog’s groomer. If your pup’s hair is matted, it can pull their skin when trying to brush, causing painful grooming while being difficult to remove. The result is that if your dog equates pain with grooming, he won’t ever want to go or be comfortable going. Avoid this scenario by keeping your dog brushed and regularly groomed. If you have any questions whatsoever concerning grooming, don’t be afraid to ask your dog’s groomer.More than likely, they’ll be happy to answer your questions and help you to keep your dog groomed properly. A regularly groomed dog is a happy dog!